Furthermore, it makes connecting with your network easy ​and facilitates introductions to people outside your network through mutual connections or a messaging system. Your LinkedIn profile is a concise version of your education and experience, which will show up in search results and remain visible for any visitor, even if they do not have a LinkedIn account. A LinkedIn profile can increase your visibility online and help build your professional brand that showcases your background to prospective employers. Professional branding is a marketing concept that reflects your professional character, skills, goals, and reputation. It gives insight into the kind of employee you are, as well as your future career aspirations. A properly curated LinkedIn profile can effectively illustrate the characteristics of your brand to new companies and future coworkers. To promote your profile, LinkedIn provides ​View My Profile buttons and badges containing LinkedIn graphics that you can add to your email signature, online resume, blog, or website. Social networking websites are constantly changing the features and navigation to improve user experiences. LinkedIn is no different, and the website offers a "Public Profile Badge Builder" that allows you to create links with an eye-catching custom badge for your LinkedIn profile. This badge provides a quick, easy way for users to move directly from your website, social media accounts, or electronic resume to your LinkedIn profile. These badges include your profile photo, job title and the company you work for. They are larger than buttons and a great way to grab attention. Use these badges on your website, blog or online resume. Log into LinkedIn and click the "Update your public profile settings" button underneath your profile picture. On the right side of the screen, there is a section titled "Customize Your Public Profile." Make any changes to your public profile settings and save them. Underneath that section is "Your Public Profile Badge." Click the link to create your custom badge. Follow the directions in the "Public Profile Badge Builder" to copy and paste the HTML codes into your website or resume. There are a few badge styles to choose from, and the code will include a link to your LinkedIn public profile. Preview your changes, if possible, before making any permanent changes that are made public. If you are looking for a small, simple button without the addition of a photo or other details from your LinkedIn profile, you have many options to choose from. These are streamlined badges that simply say "View my profile on LinkedIn" and can be placed on your website, blog or online resume. After logging into LinkedIn, go directly to this page for LinkedIn buttons 999 999 999. To add a LinkedIn button to a TypePad blog, simply click on "Add to My TypePad blog" and your button will be added to your blog. Or, choose a button and copy the HTML code in the box next to the button you have selected. There are a variety of sizes to choose from. The code will include a link to your LinkedIn public profile. Paste the code into a blog, website or online resume. Adding a LinkedIn link to your email signature is a great way to direct potential employers and connections to your LinkedIn profile every time you send an email. Once installed, the link will show up underneath your normal signature, making your LinkedIn profile accessible to anyone with whom you correspond. Add the URL of your LinkedIn Profile to your email signature. 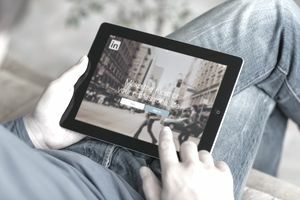 An added benefit of the LinkedIn Button is its customizable feature that allows a user to create their own signature headline. Type something along the lines of "View My LinkedIn Profile" into your signature and use your LinkedIn URL to add a hyperlink to that text.